Although there has been considerable interest in teachers’ knowledge for teaching mathematics for nearly a quarter of a century, little attention has been paid to the knowledge of mathematics teacher educators. The responses of 57 MERGA members to an online survey addressing beliefs about mathematics and its teaching, mathematics content knowledge and mathematics pedagogical content knowledge are reported. 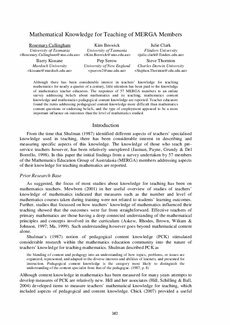 Teacher educators found the items addressing pedagogical content knowledge more difficult than mathematics content questions or endorsing beliefs, and the type of employment appeared to be a more important influence on outcomes than the level of mathematics studied.